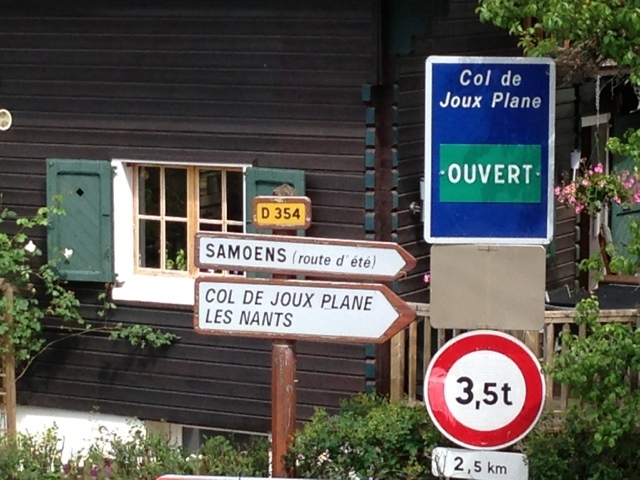 Our accommodation was literally at the base of the climb to the Joux Plane - as in, the sign was outside my bedroom window. It went straight to 10% for 2k. 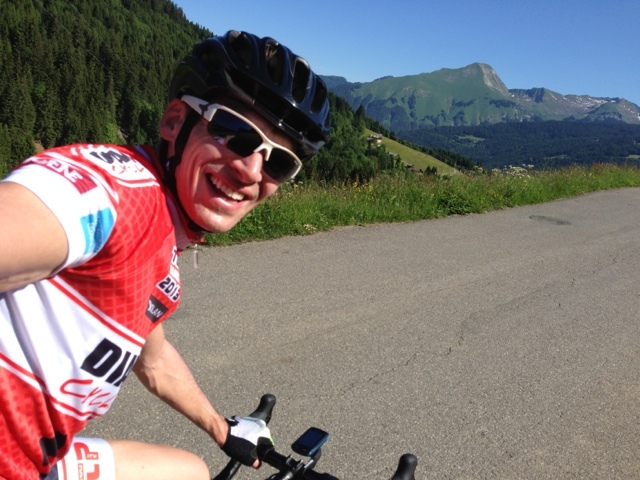 So we decided on a warm up roll around Morzine for 5k before starting the ascent. Being the first proper riding morning (and thankfully feeling about 90%) I couldn't help but think of GT, AZ and the rest of the F2 crew...but particularly AZ and GT - cos they were my F2 roomies and the morning routine was so familiar. Up, stretch, breakfast, the necessary thing you do after breakfast (you know, rhymes with schoo), shower, sunscreen, kit up, check bike, pump tyres, trash talk someone and off you go - WUWH. 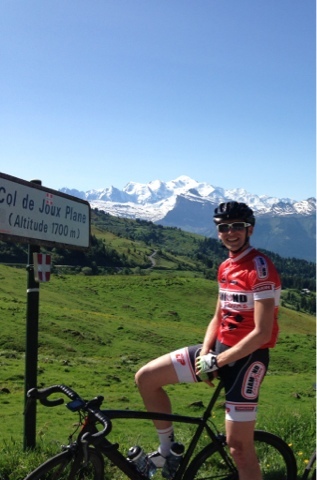 Joux plane was an awesome climb - perfect for me. About 10k at 8% with pinches of 11%. So lush and green, goats, cows (nearly hit one), and plenty of switch backs. KOM by over 5 mins just tapping it out. Incredible. 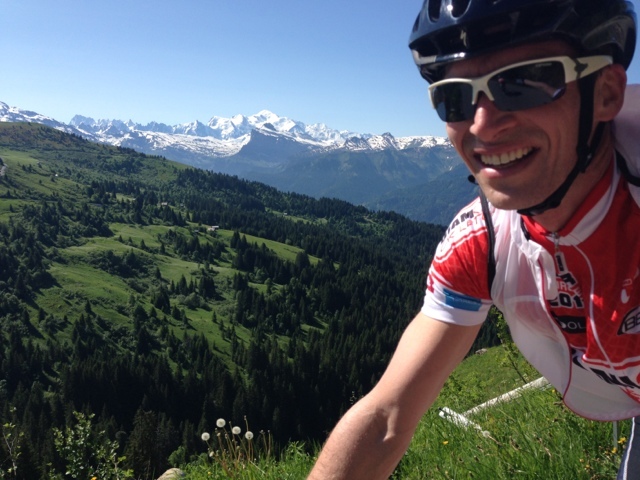 Yes, that is Mont Blanc in the background. No biggie. The descent after cafe au lait at the top was soooo freakin awesome - this is what it's all about. No cold Canberra, no sickness, no worries, just focus on the road, glimpse the scenery and FLY. I was literally giggling like a little school girl at a sleep over with a pillow fight (I'm sure they giggle when they do that!!). 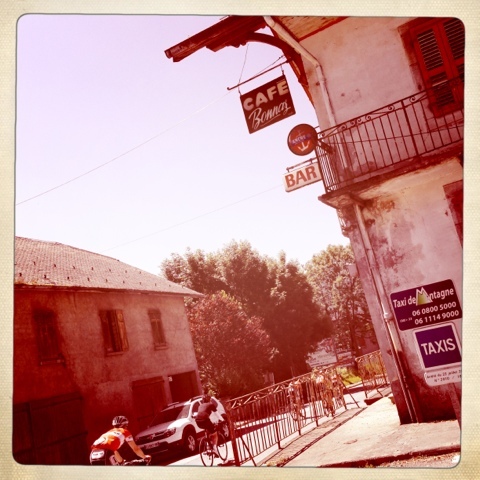 I'm serious, I was hooking into hairpin bends at 70kmh, taking them at 30, then out of the saddle in the 53/11 and back up to speed getting ready for the next one - YEEEEHOOOOOOO!! The only thing that comes close to this is flying down a steep & deep fresh powder run, through the trees, and hitting the white box at every turn. Sheer heaven! Marty had the most exciting story of the day. Just coming off the base of the Joux Plane he locked up the rear wheel heading into a fast left hander, tore through the rubber and BANG - blow out. I was right behind him and unfortunately had just stowed the video camera. Well done to his mechanic, he'd obviously talced the tubes because the puff of white "smoke" when the tyre blew out was spectacular. So now he's travelling at about 45kmh, (luckily) straight towards an uphill-side bend, one foot out, on his rim and clearly in a state of panic. Credit to him - he held it up until he hit the lush, green, pillow like grassy mound and rolled it over finishing with a (9.5) summersault. Very exciting!! We had lunch in the town square of Closes. Let's face it, they just do town squares way better than us. Oh wait - we don't even do town squares - unless you count the chess board in Civic - and I don't. 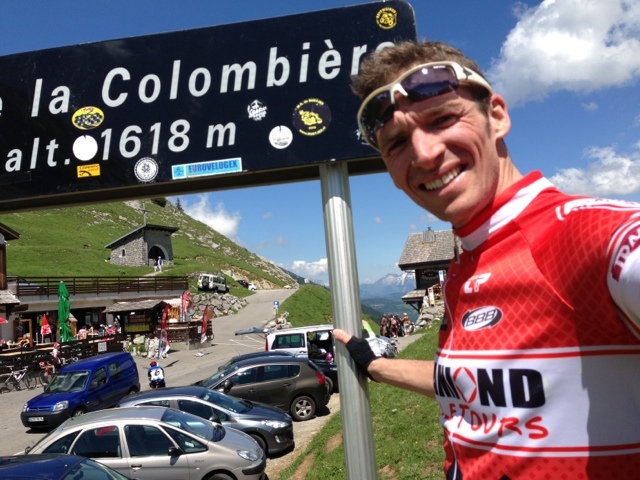 It was a short 4km transit ride onto the 16.5km Col du la Columbiere - our first big Col. Riding up I pictured the peleton around - splintering, the helicopter swirling above, the hectic crowds on the sides of the road and I felt the pain. Lunch was sitting a bit heavy but there's nothing for it - Paul and I were off the front, spinning out the consistent 8% grade - keep going! The scenery was nothing short of AMAZING. Almost too much for my brain and when we hit the 3% middle section and threw it in the big dog, I seriously thought about securing a contract with this effort. Shortly there after, any thoughts of dancing on the peddles and grinding out the top ring were shattered - I was digging deep into the suitcase of courage as she tipped up to 11% for the last 2.5k. I was toast. Paul rode away - grinding out the 25, awesome effort. I was just holding onto the 28 and often had to stand - OUCH. For me, it was tougher to able to see the finish for such a long time (photo above). You pop out of the trees at 4k to go, it's at 8-9%, a slight head wind and you know there's more to come. From here, you can see the cafe at the top and it seems impossibly close yet so high above you and even though you know you're getting closer, it's not until you are within the last 200m that it actually seems you are there. 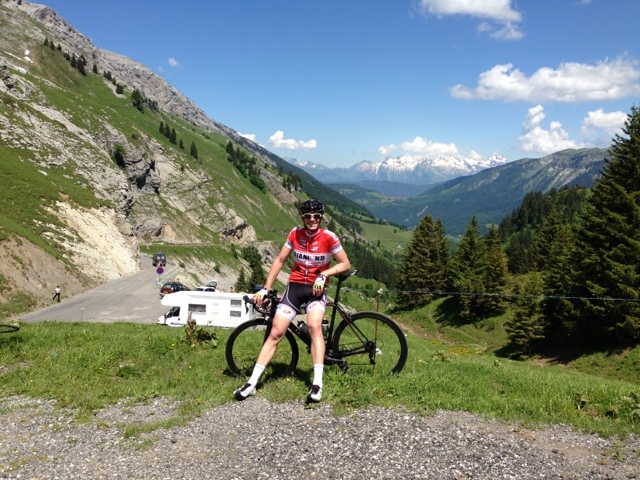 Awesome, awesome climb - it hurt me, especially so close to illness recovery and with time off the bike. I was giddy up the top - excited, satisfied and again, just so thankful that I'm here to take this all in. 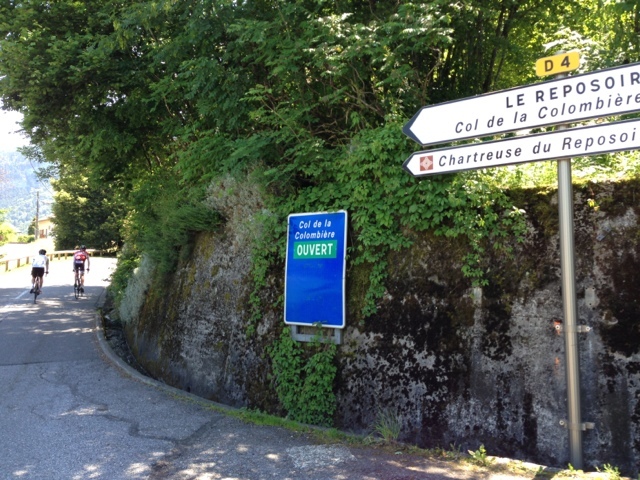 It was a super fast descent - long stretches, fast wide turns - that finished all too quickly. 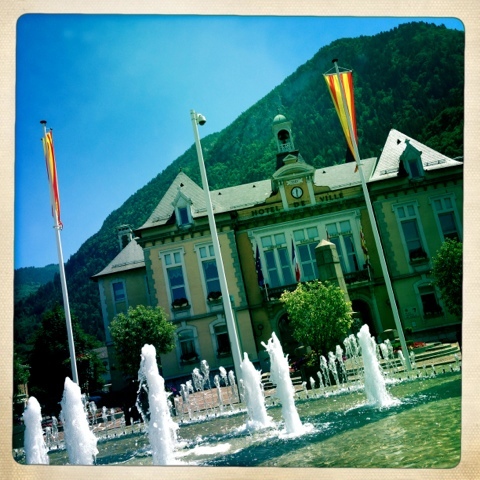 Tonight we are staying in Le Grand Bornand and there was no time wasted getting in to watch the finish stage of le Tour. More of that in a sec. 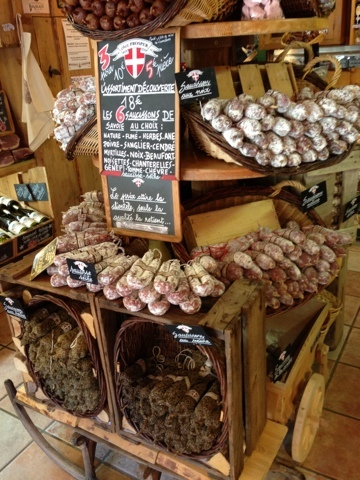 Without a doubt, this town in the French Alpes has THE BEST small goods shop I've ever been in - EVA - and as Al Quarterman would say, I know small goods. Salami blended goats cheese (as in, it was inside the salami), same for the one blended with blueberries and to have with it, a rediculously good Beaufort from Beaufort which we rode through earlier in the day. Nom nom NOM!!! 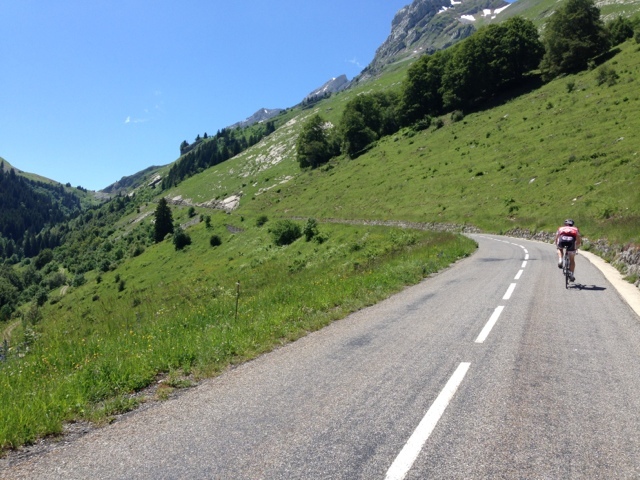 Le Tour: Simon Clarke had been on the front for OGE for ages and we caught the coverage from 40k to go. Greenedge came to the front after their final descent and it looked like they were setting it up for Gerro. The turn that Clarkey pulled deserved a medal (which he got) and the move from Impey up the inside of Cannondale and Sagan was sweet to behold. We're all on the edge of our seats and making a huge racket (nearly knocking shandies - yes, shandies - flying) and it's...can he do it...C'MON GERRRRROOOOO - YESSSSSS!!! Gerro beats Sagan - you little ripper!!!!! Oh what a day - WUWH.